The United States Holocaust Memorial Museum presents “What Were We Watching? Americans’ Responses to Nazism through Cinema, Radio, and Media” on Thursday, Nov. 15, at 7:30 p.m. at the Writers Guild Theater in Beverly Hills. 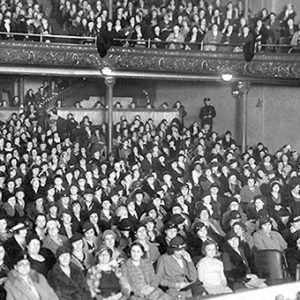 Stories about World War II and the persecution of Europe’s Jews were a constant presence in American movie theaters and living rooms throughout the 1930-40s. Award-winning films such as “Mrs. Miniver,” “The Great Dictator” and “Casablanca” shaped Americans’ understanding of the Nazi threat, while newsreels and radio programs offered a brief glimpse into world events and the range of opinions on the war effort. Panelists, who include Daniel Greene, curator of the USHMM’s “Americans and the Holocaust exhibition,” and Laurent Bouzereau, director and producer of Netflix’s “Five Came Back,” will discuss how Hollywood and leaders in entertainment and government battled for the hearts and minds of Americans. Patt Morrison, author, radio-television host and Los Angeles Times journalist, will moderate the event. The “What Were We Watching? Americans’ Responses to Nazism through Cinema, Radio, and Media” program is free and open to the public, but registration is required at ushmm.org/events. In the 25 years since it opened, the Holocaust Memorial Museum has welcomed more than 43 million visitors, including more than 10 million children and nearly 100 heads of state. A permanent reminder on the National Mall in Washington of what can occur when the world fails to act, the museum strives to confront hate and indifference, end genocide and promote human dignity. The Writer’s Guild Theater is located at 135 S. Doheny Drive. For information, contact the museum’s western regional office at (310)556-3222 or western@ushmm.org, or visit ushmm.org.